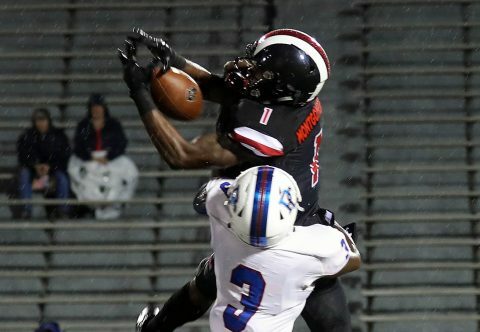 Defensively, the Govs held Presbyterian to less 200 yards total offense as the inclement weather turned the second half into a slugfest in the trenches. The start of the game was delayed 1:14 by myriad lightning strikes in the area and when the game finally got underway, a mere one minute, 59 seconds elapsed off the clock before another 1:07 delay. All that transpired over that almost two-minute span was a Presbyterian punt, which hit a Governor on the bounce and was pounced on inside the Austin Peay 40-yard line. Presbyterian’s second chance would have to wait; after the next delay passed, the Blue Hose posted a three-and-out and pooched a punt down inside the Governors 10-yard line. Austin Peay’s only sustained march of the first quarter, which featured three of DJ Montgomery’s career-high 10 catches, stalled near midfield and forced a punt. The Govs next possession ended with a bad snap on a punt attempt and Presbyterian inside Austin Peay’s 20-yard line. However, on the Blue Hose first play in the red zone, freshman Rashon Davis stepped in front of a John Walker pass near the goal line to collect his first career interception—the Blue Hose would only run two more plays inside Austin Peay territory for the rest of the game. Austin Peay finally broke through in the second quarter. After taking over inside their own 10-yard line, sophomore Jeremiah Oatsvall marched the Govs 91 yards, using his arm—for a crucial 11-yard strike to Baniko Harley on third-and-eight—and his legs for an additional 57 yards, including the final 13 for Austin Peay’s first score of the night. Junior Logan Birchfield added a 24-yard field goal late in the half to send the Govs into the locker room with a 10-point advantage. Sophomore tailback Ahmaad Tanner showcased his big-play ability on both first-half scoring drives—he kicked off the touchdown drive with a 35-yard scamper, then put the Govs deep into Presbyterian territory by taking a pass from junior JaVaughn Craig 40 yards to flip the field. The bruising back from Dalton, Georgia finished his night with 17 carries for 98 yards. Meanwhile the defense, which showcased myriad bright spots against third-ranked Georgia a week ago, stifled the Blue Hose at every turn. Presbyterian managed just 77 first-half yards and four first downs as the Govs were able to effectively keep the Blue Hose in third-and-long situations by bottling up the running game (15 carries for 18 first-half yards). Craig again orchestrated a scoring drive to open the third quarter, needing just 4:08 to take the Govs 65 yards. He picked up two 10-yard gains with his feet and found Montgomery—again—for nine yards on third-and-four. Junior tailback Prince Momodu punched it in from three yards out for his third career rushing touchdown. Austin Peay’s final scoring drive of the night featured another steady diet of Craig, including a 49-yard scamper down to the Presbyterian 16-yard line. Craig took it the final eight yards himself for his 10th career rushing touchdown. He finished the night with a team-high 108 yards rushing on just eight carries and added an efficient 11-for-18 passing night for 127 yards. A favored target of both Craig and Oatsvall was Montgomery, who finished with 10 catches for 114 yards. The Blue Hose never threatened in the second half—Presbyterian’s only play in Austin Peay territory in the second half was the game’s final play from scrimmage, and ended with a seven-yard loss. The Govs will not rest on their laurels after this victory—Austin Peay kicks off a three-game road trip next week at Morehead State, beginning with a 5:00pm (CT) at Jayne Stadium against the Eagles.